President Obama bashed George W. Bush while in France today. Obama apologized for American action that liberated Iraq from the genocidal tyrant Saddam Hussein. 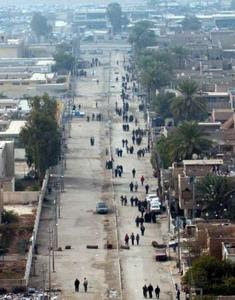 Iraqis walk to polling stations to vote in their first democratic elections in 2005. Speaking before a French and German audience at a town-hall style gathering, Obama encouraged skeptical Europe to support his retooled strategy for rooting out terrorism suspects in Afghanistan and Pakistan. For the record, the majority of European countries, except Spain, elected Pro-US leaders during the Bush years. The new European leaders are also more conservative than President Obama. At last report, the US still has troops serving in Iraq. More… His speech in Strasbourg went further than any United States president in history in criticising his own country’s action while standing on foreign soil.